Even the most modern dental techniques and treatments can lose some of their shine if they’re offered in a practice where you feel cold, uncomfortable, or even unwelcome. Dr. James Williams and his team have worked hard to create an environment for patients that’s just as welcoming and cozy as a room in their own home. Your trust and satisfaction mean the world to us, and with the help of advanced tools and our own brand of honest, supportive dental care, we’ll be sure to deliver a smooth and enjoyable experience every time you and your loved ones come in for an appointment. Advances in dental technology have made treatment a much simpler and more comfortable process than ever before, and here in Allen, TX, our team is happy to be ahead of the curve. With our digital panoramic machine, we can take much more precise photos and X-rays that offer valuable insight in regards to diagnosis and care; we’re even able to pull them up nearly instantly on a convenient chairside monitor so that you can view them as well! Best of all, it’s a much safer method that emits only 1/7th of the amount of radiation traditional machines do. We also use intraoral cameras, which consist of a pen-sized wand with a camera at its tip. This device goes into your mouth and takes a video of the inside, transmitting these images to a monitor that you can view comfortably. This allows Dr. James Williams and his team to point out potential problems and concerns in a much clearer way. We always enjoy helping our patients become involved partners in their oral health care. A CEREC machine is a staple in our office now as well, which helps us to create beautiful, customized crowns and other restorations on a much faster timeframe than ever before – usually in just a single appointment! Of course, it’s the little touches that can really make a difference in a patient’s dental care experience. 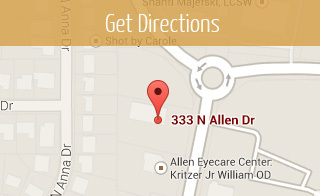 From the moment you first enter our Allen, TX dental office, you’ll be greeted by friendly faces and treated warmly. We do our best to foster a deep level of communication between patient and dentist, which is why Dr. Williams will take the time to learn about you and your family, as well as what your unique hopes and goals are for your smile. If you ever feel unsafe or uncomfortable at any point during your appointment, please let our team know right away and we will do what we can to make your experience much more relaxing. Contact the office of Dr. James Williams, DDS today to schedule an appointment! We can’t wait to give you and your family something to smile about. Located in Allen, TX, we also welcome patients from The Colony, Frisco, McKinney, Plano, and beyond.